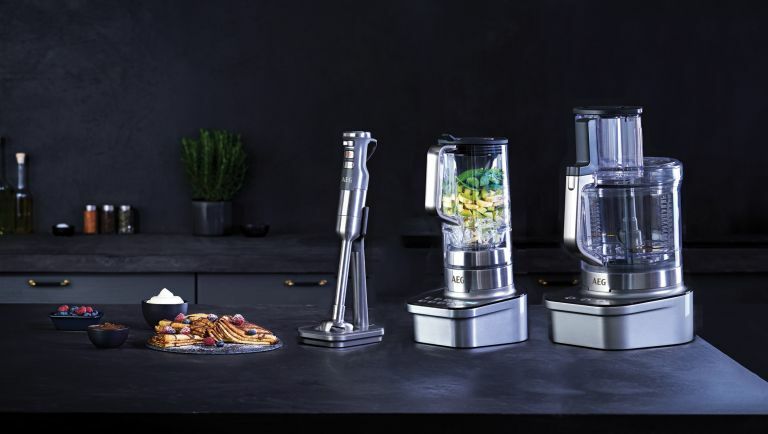 German kitchen appliance specialist AEG has just announced a new range of powerful food processors, GourmetPro, which takes powerful, high-end blending and food processing power out of professional kitchens and straight into yours. The range, which includes a blender, food processor and stick mixer, was designed with the LeCordon Bleu Culinary Institute has even been awarded Good Housekeeping Approval so you get some idea of just how pro these appliances are. The big selling point for the GourmetPro range is its PowerTilt tech, which involves using a variet of unusual blade designs that help blend food quicker and more efficiently. If you love making smoothies, but hate finding unsavory lumps of mush floating in your beverage, this feature will appeal. Alongside those titanium coated blades, and a variety of processing speeds for crushing ice, blending fruit and more, the AEG GourmetPro range also operates at a lower temperature than most blenders, which helps preserve a lot of the nutrients that are normally destroyed as processors heat up while in use. "Consumers are looking for professional level products for the home more than ever, thanks to the popularity of cooking and baking programmes," says Richard Vallis, AEG head of Product/Brand & Marketing, Small Domestic Appliances. "With GourmetPro™, you can rest assured that you will achieve the best tasting results possible. The new PowerTilt® technology ensures that food is prepared and chopped in the optimum way to preserve flavour and nutrients. The products also come with a variety of features that you would expect from AEG quality products, such as easy to clean and robust surfaces, to make the cooking process as simple as possible for the user." The GourmetPro® Blender SB9300-U will retail at £399.99 and the GourmetPro® Food Processor FP9300 will go for £629.99, while the GourmetPro® Stick Mixer STM9500 will retail at £229.99. You can pick up all three from AEG's online shop from next month (the webshop itself also launches in July).